Often when I am scrapping, I just plain run out of ideas. 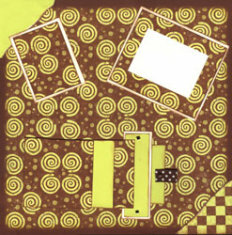 That is when I turn to pre-made Scrapbook Page Kits. These kits I picked up at the Scrapbooking Expo in Atlanta, Ga in July 08. 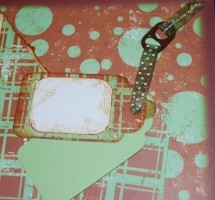 These were kits that I purchased from a class taught by Lori Kinchen & Liesl Schmidt called “On the Move Layouts”. We received and learned how to make 3 two-page layouts that incorporated movement in some way directly on the scrapbook page. 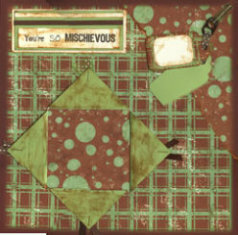 The Scrapbook Page Kits contained everything to complete the layouts, including cardstock-weight paper, ribbons, journaling, brads and even pop top embellishments painted chocolate brown to go with the pages. All papers were pre-cut and the only thing we needed to add to complete the pages was a small pair of scissors, adhesive and a brown ink pad (actually optional), and agile fingers to tear some of the papers and tie some of the ribbons. The Scrapbook Page Kits from the class contained a Peek-A-Boo Slide option, a Waterfall option and a Window. All were available in a double-sided cardstock-weight paper line designed by Lori Kinchen called "Chocolate Truffle" - all with a luscious brown base. The colors available were Blueberry Muffin, Grape Juice, Lemon Zest, Mint Chocolate, Orange Cream and Strawberry Shortcake. 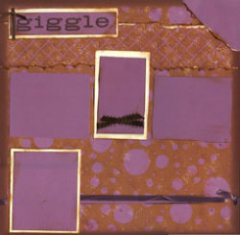 This first Scrapbook Page Kit was the Peek-A-Boo layout which uses the “Blueberry Muffin” papers from the "Chocolate Truffle" line. The title Giggle in the upper right corner is actually defined below, under the photo matte at the bottom left. To read the definition, pull the ribbon on the right side of the page to reveal a strip of journaling that is actually the definition of Giggle. Above is a close up photo of the Slide or Peek-A-Boo revealed. 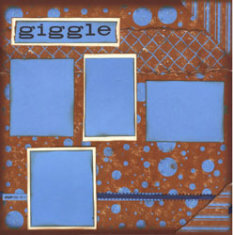 The definition of "Giggle" is hidden behind the photo matte and is revealed when the ribbon on the right is pulled to make the photo matte slide to the right. Along with the kit supplies is a direction sheet on how to make the Peek-A-Book Slide as well as how to assemble the layouts. 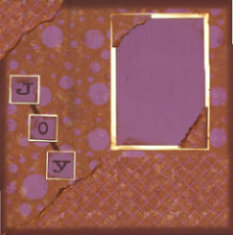 Above is another Peek-A-Boo layout - this time using the “Grape Juice” papers from the "Chocolate Truffle" line. The title Giggle in the upper right corner is actually defined below, under the photo matte at the bottom. To read the definition, pull the ribbon on the right side of the page to reveal a strip of journaling that is actually the definition of Giggle. 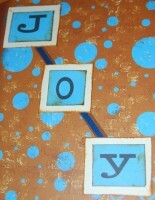 The Companion page on the right uses the torn paper backgrounds with a coordinating paper, a large double matted area for one 4x6 or 5x7 photo, the word Joy spelled out with individually matted letters held together with a ribbon. 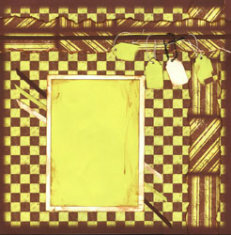 Above, these next two Scrapbook Page Kits in the “Lemon Zest” papers from the "Chocolate Truffle" line show the Waterfall - an element that appears to be one photo, but is really a series of photos that show when the viewer pulls a tab on one side of the element that causes the other photos to be revealed. Other elements include torn paper corners, a double matted photo frame, and small double matted journaling block. Above is a close up of the bottom left-hand page with the “Waterfall” in the open position. This particular Waterfall holds up to 6 photos, one on the outside cover, one on the inside of the cover and two more pages and one on the base and another on the part that pulls the rest of the pages into view. Along with the kit supplies is a direction sheet on how to make the Waterfall as well as how to assemble the layouts. Here is the same Waterfall kit done in the Pink “Strawberry Shortcake” cardstock from the "Chocolate Truffle" line. 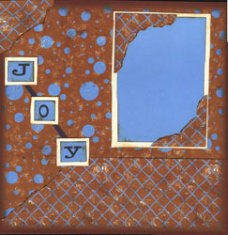 The torn paper background is done using 2 coordinating backgrounds with one framed matted area for a small photo and one small journaling block. The companion page on the right has torn strips of coordinating paper, double matting for a large 4x6 or 5x7 photo, three small coordinating tags hung with string from a strip of cardstock on the upper border and narrow paper strips under the large photo matte. All of the solid color elements were distressed on the edges with a brown ink pad. These two layouts using the Window make really good use of the double sided papers. The 4 corners of the cutout in the lower left of the page were folded back, adorned with ribbons, and adhered to the background with staples. 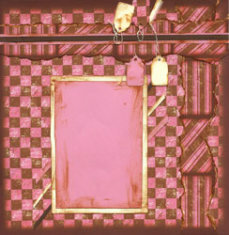 The embellishment in the upper right corner consists of three tags, tied with a length of ribbon, run through a “pop top” painted brown, with another piece of ribbon stapled to the page. 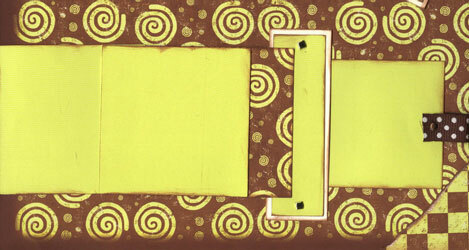 The companion page on the right uses three designs of torn papers and small pieces of tiny ribbons adhered to the bottom of the journal block in the center. 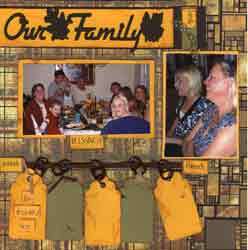 Another set of 2-page kits from Lori Knichen and Liesl Schmidt comes in the "Gridlock Collection" of papers. 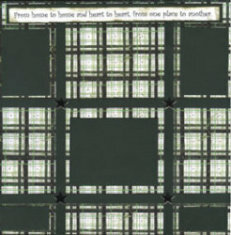 The papers are available in 3 designs titled Chaos, Mosaic and Order (Plaid) and in 6 colors of Green, Rust, Blue, Purple, Red and Pastels. These pages below use the Mosaic on the outside strips with the Order for the rest of the background page. 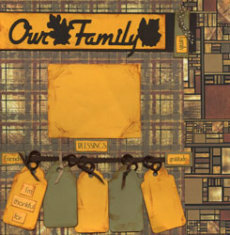 Like the other Scrapbook Page Kits above, this kit contained all the background cardstock-weight paper in the rust-brown-gold combination of the Gridlock papers, the accent papers, photo mattes, tags, journaling, ribbons, 2 title die cuts, and brown “pop tops” to use for hanging those cut little tags. 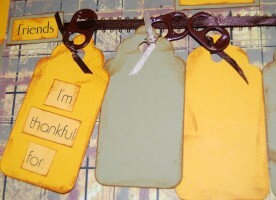 I remember the Thanksgiving tradition of going around the table and speaking about what we were thankful for - what a great place to journal those thoughts but on those cute tags hanging from those brown "pop tops". 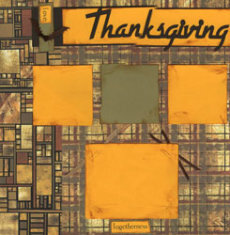 This pages above may not hold all of your Thanksgiving photos, but it is a great starting layout to your holiday season. When you use a kit, you don't always have to fit the photos exactly on the matted areas. When these photos were added to this pre-made kit page, I moved the center matte to the left and added a second matte to the right to add a related photo. 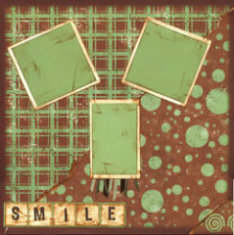 On this layout, I cut one photo to fit 2 of the small photo matte squares after they had been moved next to each other. For the tall photo, I removed the third small matte, cut it in half from corner to corner and used those pieces to matte the top and bottom of the photo. 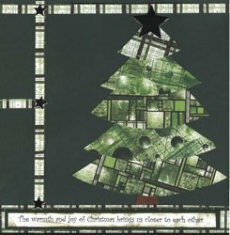 This kit, titled “The Warmth and Joy of Christmas” is stunning made with the beautiful "Green Gridlock" papers with pre-cut sections for the tree itself, the paper ribbon stripes and silver metallic stars for the tree topper and page accents as well as wonderful journaling for both pages. These pages below use the Mosaic, Chaos and Order designs to form the Christmas tree on the right side. What a great opening to begin your latest series of Christmas photo layouts. 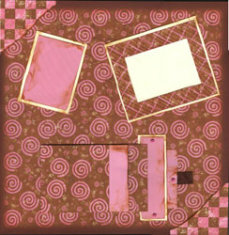 These papers shown above are available for purchase at scrapbookingwholesale.com.